Local author Chris Barton has allowed us to share his conversation with Lynda here. To keep up with all of his great conversations with authors, and to be eligible to win free books from him, sign up for his newsletter. CB: What drew you toward the story you tell in Fish in a Tree? LMH: The reason I first sat down to begin Fish in a Tree was because my editor, Nancy Paulsen, had asked me if I thought I could write a book with a main character who has dyslexia. Of her writers, she thought that I would be a good choice because I had had 10 years experience in the classroom. Staying fully aware of my difficulties as a student when I was young, it’s shocking that I was halfway through Fish in a Tree before realizing that it was semi-autobiographical. The facts of the story may be fictional (although there are several scenes lifted right out of my “school daze”) but the emotional arc is absolutely mine. I was a student who struggled quite a bit in school until I met Mr. Christy in the sixth grade. No doubt that this man totally changed my life for the better. In the end, I realized that this book was a love letter to him and all other teachers like him. CB: Tell me about the kind of kid you think Fish in a Tree will appeal to the most. LMH: Fish in a Tree is very much a school story, focusing on the new teacher Mr. Daniels and eight of his students. Like real classrooms, there is diversity in race, culture, socioeconomic status, intelligence levels, personality types, and family lives. And, just as in real life, each of the students brings their own experiences, worries, hopes, strengths, and insecurities to this classroom community. My main character, Ally Nickerson, struggles in school and is ultimately diagnosed with dyslexia. However, her dyslexia is not the focus of this book because I am a firm believer in that we should never be defined by a single label. Kids feel like they are, sometimes, but I hope they will learn to view themselves as people with a myriad of gifts and shortcomings. And I don’t necessarily mean just negative labels, either. As teachers, we’ve met the kids who are really good at something e.g. football and use that label as an excuse to wall themselves off from new experiences. Fish in a Tree is for the reader who has ever struggled with something. Has ever loved a sibling. Has missed a parent who is deployed. Has ever had a friend or been a friend. Who has ever felt lonely. Who has a sense of humor. Who roots for the underdog. Who has ever felt like there is something wrong with them because they are different. For more about Chris and his books, visit his website. You can sign up for his enewsletter and have his conversations with authors delivered directly to your inbox. 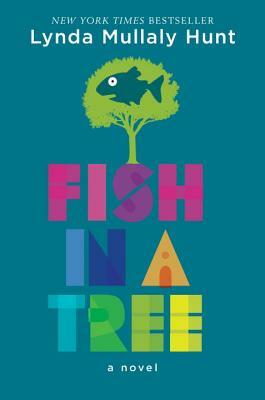 Copies of Fish in a Tree are available on our shelves and via bookpeople.com. Thank you!! I am a HUGE fan of Book People–I was there (and in awe) about two months before One for the Murphys was released. I’m also a huge fan of Chris Barton! Thank you so much for posting our interview. I’m honored!